Kids love Jay Jay and you will too after watching this fun DVD from Roadshow Home Entertainment. Jay Jay not unsurprisingly is a jet plane who gets into all sorts of adventures in the hidden land of Tarrytown, just over Tippy Top Peak. There Jay Jay and friends learn about life, friendships and also morals and other values without going about it in too preachy a way. Episodes are well timed, running for about 13 minutes each, just long enough to keep the kids highly entertained without losing them, and also long enough that they are keen for the next one to continue the adventure. 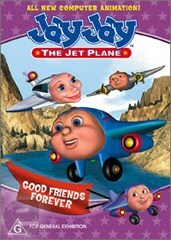 Jay Jay is a cute little six year old jet plane that still has a lot to learn about the world and in dealing with other “people”. His friends help him out and there are a number of older “adult” characters that also provide him with assistance in getting back on the right path and finding his way through the world. Tarrytown itself is almost a character with it’s lush green fields and snow capped mountains that inspire the sense of adventure in Jay Jay and Tracy. Fortunately with friends like Big Jake they are soon set straight. Graphically this series is a delight to watch and the innocence of Jay Jay himself is sure to have the kids watching very happily indeed. The animations on this series are all very well executed, creating a series of characters that are instantly likeable which is great for the audience the disc is aimed at. The interaction in the storyline is sufficient that your younger viewers will not get lost either.